Our most popular entrée! Enjoy a super flavorful aged juicy prime rib served with garlic bread, choice of salad, creamed horseradish, au jus, and choice of side. Only available Tuesdays, Wednesdays & Thursdays! The best available high quality USDA beef is cooked over real mesquite charcoal - no gas, no electricity, no folderol. Just the best darn steaks you ever tasted. To keep too much celebrity from going to our heads, we have a strict no-tie policy. You can see the results of that policy strung from our rafters, a constant reminder not to take ourselves too seriously. But the one thing we do take seriously, is our desire to please you. Add these sides to any entree! Take these sides to any entree! Your choice of side (No preservatives): Mashed potatoes, baked potato, fries or sweet potato fries. And of course... garlic toast 7 western beans! 8 OZ. Top Sirloin - The Best Bang for the buck! Chicken marinated with fresh herbs and slow roasted over mesquite. 16 oz. Top Sirloin - Bigger bang for the buck! Best of both worlds! fresh mesquite grilled chicken with succulent shrimp sauteed in butter cream sauce. 32 oz. Top sirloin - The cowboy can be served to one or two without an additional charge. Golden brown lightly seasoned pork chops grilled to perfection. 8 oz. Filet Mignon that melts in your mouth. 8 oz. of skinless chicken breast, on two skewer with grilled veggies & our homemade BBQ Sauce. 12 oz. Filet mignon for the healthy gourmet. 8 oz. of Filet Mignon & TOP Sirloin on two skewer with grilled veggies & our special BBQ Sauce. 16 oz. RIB - Eye Mesquite grilled center cut , cooked to perfection. Slow cooked flavorful pork ribs glazed with our special sauce. 12 oz. New York, hand selected & marbled to perfection. Two 8 oz. Lamb Chops Grilled over mesquite served with a side of mint jelly sauce. 16 oz. Porterhouse, outstanding taste and aged to perfection. 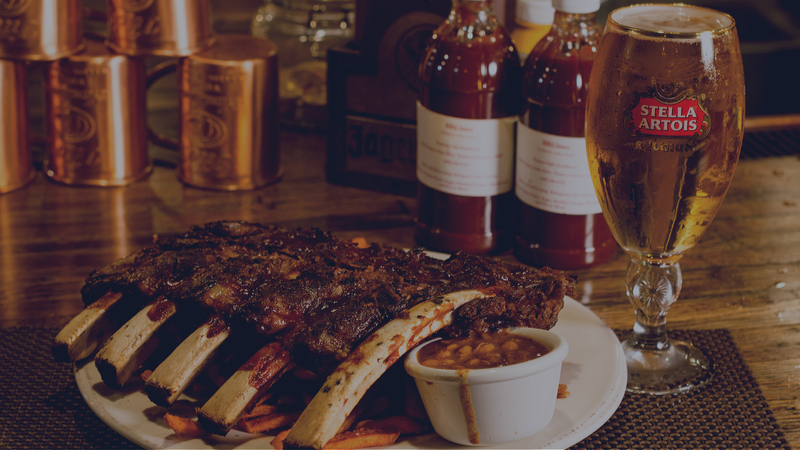 Tender Juicy beef ribs glazed with our special BBQ sauce. Thoroughly cooking foods of animal origin such as beef, fish, lamb, milk, poultry, or shell stock reduces the risk of food borne illness. young children, the elderly and individuals with certain health conditions may be at a higher risk if these foods are consumed raw or undercooked. The filet mignon of whitefish! Enjoy our wild caught 10 oz. Halibut grilled over mesquite served with AL's tartar sauce. Fresh pieces of cod fried in a light batter to a crispy golden brown served with fries. Stuffed with tender lobster and romano cheese in our white wine basil cream sauce, topped with sun-dried tomatoes. 9 oz. 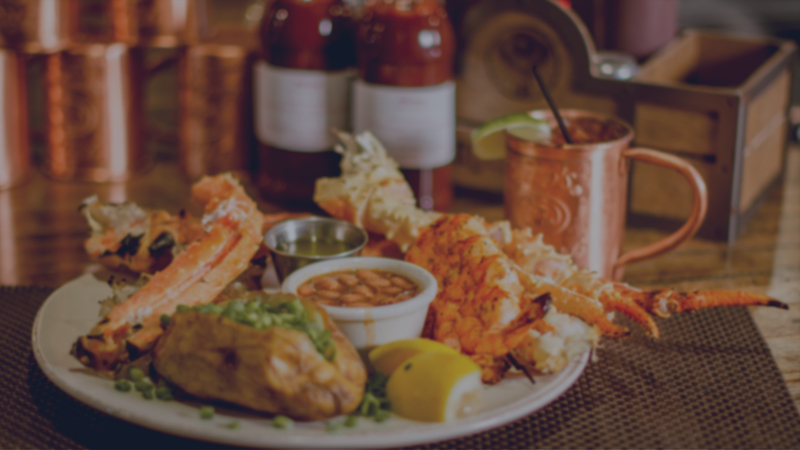 tender lobster tail cooked over our mesquite grill served with our western beans and your choice of side. A great combination of fresh garden vegetables, steamed to perfection,\ If you want more add a set-up! Don't feel like meat tonight? This is for you! It's the salad, garlic toast , fries or baked potato, and western beans. Half-pound patty, broiled over the pit, placed between sourdough garlic toast with cheese & onions, served with fries. Boneless & skinless chicken breast marinated with teriyaki sauce and served on a sesame seed bun with mozzarella cheese & slice of pineapple, Served with fries. Lightly battered fried fish with fresh fries (no preservatives). Our skillets below are perfect for sharing! Hot skillet of fresh button mushrooms, simmered slowly/ in red eye (sherry) garlic. Topped with parmesan cheese, bell peppers, onions, and special seasonings. We combined the mushrooms and zucchini with all the special ingredients mentioned above for the best of both worlds! Coke, Diet Coke, Dr. Pepper, Sprite, Milk, Raspberry Lemonade, Pink Lemonade, Ice Tea, Hot Tea, Hot Chocolate, Coffee and Decaffeinated Coffee. We have a great selection of draft, domestic, and imported beers & Wine. We’d love to make your favorite ﬁre-waters! 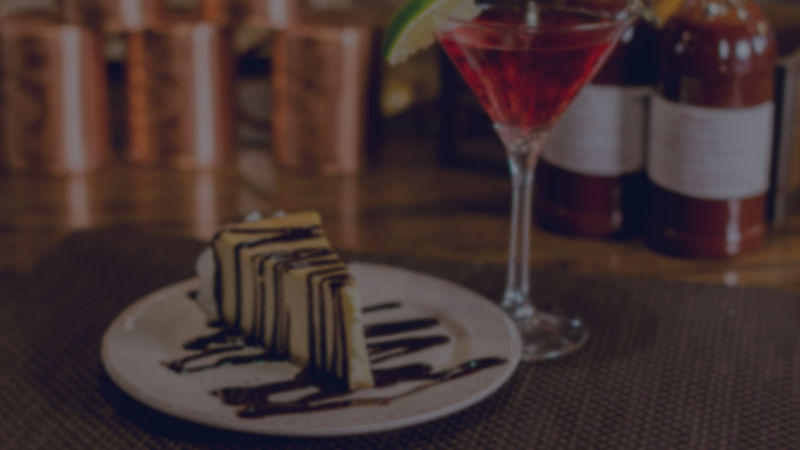 Ask your server for our cocktail list for ideas. Ask your server for the selection. A combination of warm, rich chocolate fudge mixing with frozen ice cream and melting it slightly is absolutely irresistible. Our rich sweet tart made with cream and soft cheese on a biscuit base. A classic end to a great meal! Satisfy your chocolate cravings with our delicious mud pie! Perfect to share! Rich, fudgy chocolate cake filled and frosted with our house chocolate buttercream. So you want something smaller but just as rich? Ask your server about our weekly selections! Thoroughly cooking foods of animal origin such as beef, fish, lamb, milk, poultry, or shell stock reduces the risk of food borne illness. Young children, the elderly and individuals with certain health conditions may be at a higher risk if these food are consumed raw or undercooked. RED BLEND, CNARLY HEAD, "AUTHENTIC RED"
ALE SMITH ESB 12 oz.